NATO forces killed a civilian in Kabul Thursday, sparking a protest by dozens of residents, officials said, DPA reported. The NATO-led International Security Assistance Force (ISAF) said it was investigating an incident in which its forces killed a civilian. "We can confirm one civilian was killed by ISAF forces this morning during an incident involving an ISAF convoy," it said in a statement. Dozens of people gathered in front of Camp Phoenix, an ISAF military base in the eastern part of the capital and blocked the road that links Kabul to eastern provinces. The protestors told Tolo, a private television broadcaster, that the deceased was an imam for a local mosque and was shot dead while crossing the road. Civilian deaths at the hands of international forces have been a major source of friction between NATO and the Afghan government. More than 2,400 civilians were killed by Taliban militants and international forces last year, according to a United Nations report. The incident happened on the same day that leaders from about 70 countries and international organizations were attending a conference in London to map out NATO's future Afghanistan strategy. Meanwhile, up to 20 Taliban insurgents were killed in an air raid by NATO forces in the northern province of Baghlan, the ISAF said Thursday. Wednesday's airstrike was ordered after a patrol was attacked by militants in the area, it said. 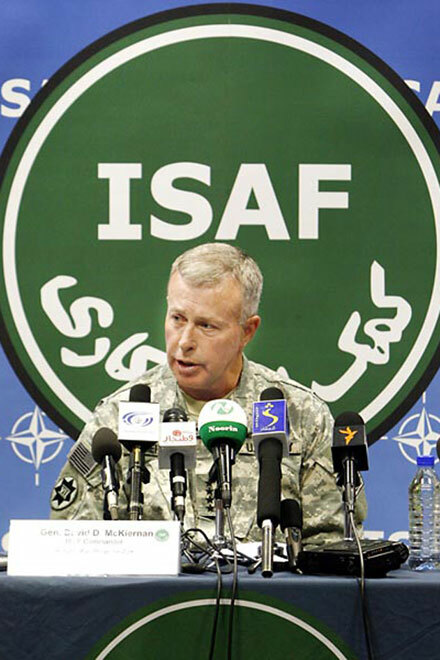 "ISAF air assets bombed and strafed the insurgents in a tree line," it said in a statement. "Afghan national security forces estimate 12 to 20 insurgents were killed." Mohammad Kabir Andrabi, Baghlan's provincial police chief, said that according to his information, 15 insurgents were killed and up to seven were injured.